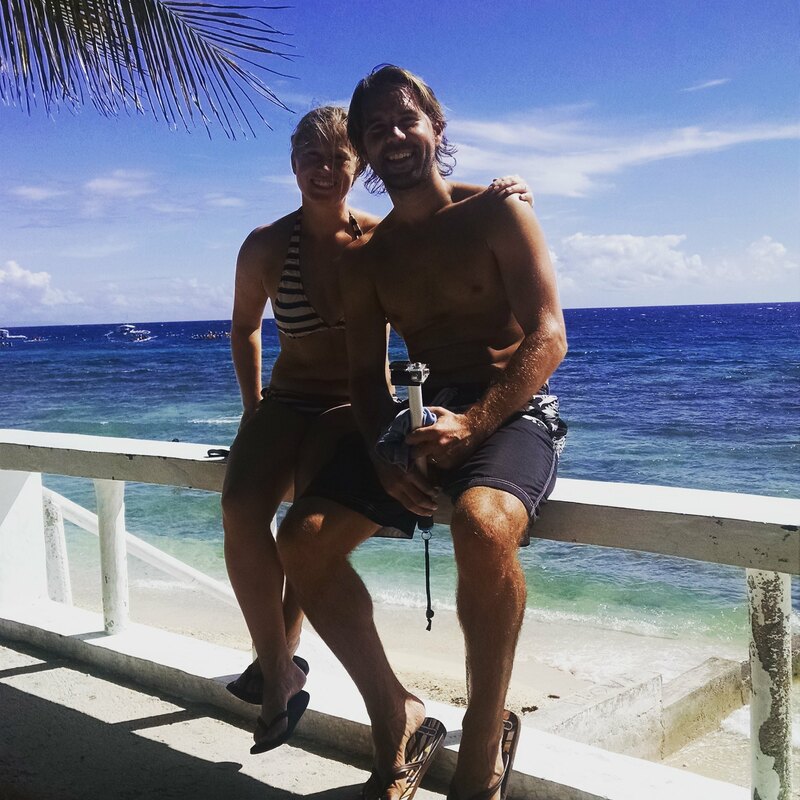 When we booked our tickets to Thailand, we decided that our last stop of the trip would be in the Philippines. We fly home from Manila (the major hub) on December 22. Wow. Ok I can’t think about that right now. 😉 With all the beautiful pictures of perfect beaches and turquoise water, we knew this would be a great spot to end the trip. During my quick research of scanning the internet about what is best in the Philippines, I came across the opportunity to swim with whale sharks in a town on Cebu Island called Oslob. Swimming with the whale sharks is actually quite controversial (the locals feed the whale sharks) and with a quick google search you will come across a handful of articles telling you why you should not do it. I read these, and while they have solid points I selfishly knew if i was going to travel half way around the world and wanted to actually be guaranteed to see these gentle giants, this was the place to do it. Oslob is on the very south east of Cebu. After our arrival, we quickly realized that everything in this town required cash, no credit cards. That was a bit of problem because we only had about $20 USD worth of pesos on us. Not great considering the only town with an ATM was an hour away (the area we just came from) Oops, poor planning on our part. It all worked out and we were able to catch the public bus there and back but it made for an even longer travel day. 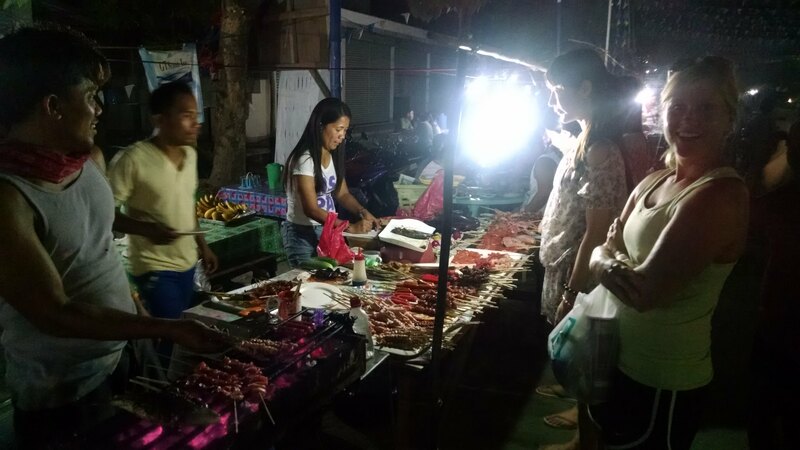 On the way back we stopped at a little road side bbq where they where grilling a variety of interesting meats. Chicken livers, intestines, feet, pork something or another… Jeff chose a regular bbq chicken breast which was quite tasty for $1.50 – we passed on the other organs. Early the next morning was our chance to swim with these giants. It’s a pretty simple operation they have going on. All the beach side hotels sell the tickets you buy the day of. You can go anytime from 6 am till noon. We chose the first slot at 6 am because I had read they would be most active and hungry, and less crowded. Your ticket gets you 30 minutes of swim time with the sharks for $20 each. The swimming area takes place right off the shore so it’s pretty quick and easy to get to. There are a lot of canoes and a lot of people. It continued to get more crowded throughout the day. Here is the view from our hotel. You can see the boats in the back left corner and that is where the whale sharks are. Each group must sit through a quick briefing and orientation where they go over the rules and regulations. No sunscreen, no touching, you must remain at least 5 feet away from them at all times. Failure to followw all the rules results in big fines. While they are “whoring” these whale sharks out, they are at least doing a good job to make sure it is controlled and they are protected. They realize that if the whale sharks go away, so does this revenue generating business that attracts thousands of tourists. So the canoe driver paddles you out and then parks in a line while all the tourists jump off into the water. 30 minutes starts now. The whale sharks are swimming all around you because the their are feeding boats (about 3 of them) are feeding the sharks small pieces of shrimp/krill. This is what attracts them up to the surface. There are 15 whale sharks in the area that typically come up each day. We saw 4- I think. It’s hard to tell because they are circling around and passing back and forth following the boat that has the food. Whale sharks are massive, and they can get to be over 30 feet long. The biggest one I saw in the water was about 20 feet, still pretty fricken big. There was a smaller baby who was still 12 feet long. This was a definite highlight on our trip this year and something Jeff specifically had always wanted to do since he was little. I’m glad we did. It was pretty awesome to see these creatures so close. Instead of trying to describe it all in detail, we made a short video. Enjoy! Hi Lindsay! I’m glad that you enjoyed not just your Cebu experience but the Oslob as well. We went to Oslob also last week and it was an awesome experience. I really enjoyed swimming with the whale sharks. I’m a bit afraid though because of its big mouth. I have a funny video of it on my blog as well. Haha.